LIMITED TIME ONLY…FREE SHIPPING ON ORDERS OVER $50!! COMPLETE BODY COOLING. We’ve taken our popular Equine Body Wrap and super-size it – covering more than ever before. The body portion has been increased from 60″ x 63″ to 67″ x 82″ and we’ve added a chest flap and a removable belly flap! What more can a horse ask for? Check out our How-To Video for care and use instructions. Fits up to 18-Hand Horses! 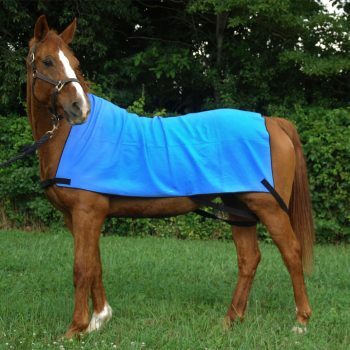 Cool your horse’s core temperature quickly with Equi Cool Down’s body wraps. Ideal for recreational riders who want to improve their horse’s comfort. Excellent for competition riders who need rapid stabilization of core temperature to give their horse a more competitive edge due to quicker recovery from exertion. PERFECT for horses suffering from Anhidrosis (“No-Sweaters”) and other heat-related problems. The versatile “one-size-fits-most” design of these body wraps is achieved using flexible and adjustable leg and chest straps. Their design ensures that the body wrap will be held in place while still enabling your horse to move around with minimal restraint. May significantly alleviate symptoms arising from Laminitis, Allergies, Thermoregulation, Cushings Disease & Inflammatory Airway Disease. The revolutionary Equi Cool Down wraps will put an end to the days of continuous hosing and scraping. To activate the cooling mechanism, simply spray with water and wave! The wraps contain NO gel, NO beads or crystals, NO frozen inserts, NO electricity needed. 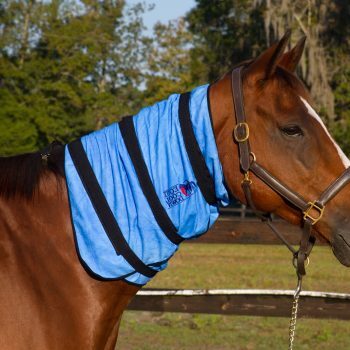 Equi Cool Down wraps gently cools effected areas, eliminating the risk of tissue damage from extreme cold. If the wrap feels warm to the touch after a few minutes, that simply means it is working! To reactivate the cooling the process, spray the wrap with water, warm or cold, and walk horse or flap sides to infuse air flow. It is THAT easy. 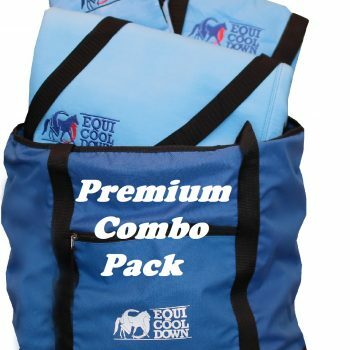 Equi Cool Down wraps are safe to place directly on your horse. No cover or sock is needed to keep the wrap debris free. If it gets dirty, simply hose it down, hand-wash or even put in your washing machine with a mild detergent. 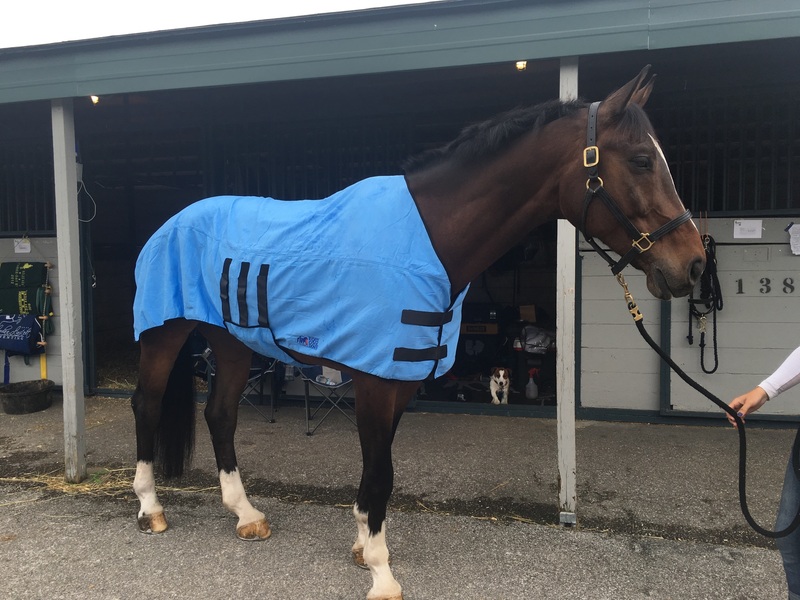 Use over and over again; Equi Cool Down wraps will still get cold! On a trail ride not even remotely close to a hose? Trailering your horse? Any source of any temperature water will work; a pond, a well, a swimming pool – just fill a spray bottle and spray the wrap down. Keeping the wrap wet is the key to all-day coolness. 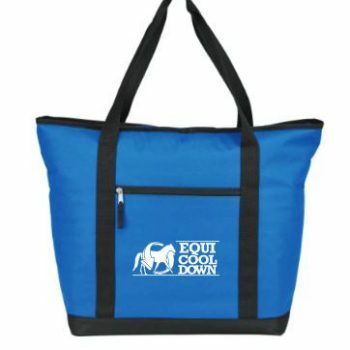 These wraps are truly the most innovative product to hit the equine market! Before using your new Equi Cool Down products on yourself or your horse, please be sure to read our instructions for use and watch our care & use video for maximum benefits. This will ensure that the products have sufficient water to do their job and keep you and your horse cool, while allowing circulation and not becoming over-saturated which can actually inhibit air flow and cooling effect. If you have any questions, please contact us. When my Friesian is having trouble with the Texas heat I use this to bring quick relief. So much easier than having to give him multiple showers throughout the day when he starts to overheat. This has saved me time & potentially my horse’s life. Love the new design on this one too! The cool blanket has become part of our daily routine at Dresden Manor. Having a full barn in south Florida it allows us to safely ride during the middle of the day when the heat index gets well over 100 degrees. It also keeps my horses cool before and after competitions which gives me that extra edge against the competition. We make products designed to keep you and your horse cool in the hottest of temperatures, to help you recover faster after a workout, and even help reduce swelling and speed healing in the event of an injury. Learn More about us and our products today! For more than just those hot summer days, reduce inflammation, help speed up recovery time, even assist in rehabilitation from strains, sprains, and more. There's a lot that our cooling products can do for you.